The Great Bahama Bank is a pile of coral reef limestone at least 4500 m thick that has been accumulating since Cretaceous time. The entire pile was deposited in warm shallow water, so the foundation crust must have been slowly subsiding at an average rate of at least 3.6 cm per 1000 years (Newell, 1955). The crustal block basement underneath the Bank is continental in structure and may have rifted from North America when that continent began to break off from Africa and the Atlantic Ocean originated. The Bahama Bank is now separated from the mainland by the Straits of Florida, which reach depths of 760 m. The eastern edge of the Gulf Stream sweeps northward past the western margins of the Bank at a speed of 3 km per hour, about half as fast as the main current near Miami Beach. On the Atlantic Ocean side, the platform drops steeply to depths exceeding 4000 m just 20 km to the east. Depths within the bank proper are seldom greater than 6 meters. Most bedrock under Great Bahama Bank is coral-reef limestone, as indicated by a deep well on Andros Island. The nearly vertical submarine cliff that forms the west bank edge must be built of Tertiary-age corals. It has the same form as the ribbon reefs of the Australian Great Barrier Reef (Plate C-18) or mid-oceanic atolls such as Jaluit atoll (Plate C-19). The west cliff descends abruptly to depths of 30 to 60 m, then less rapidly to the floor of the Straits of Florida. The loose shifting sands of the present Bahama Bank could not maintain such steep gradients. Various species of coral live on Great Bahama Bank, as they do in the nearshore zone of Florida, but their growth is so slow that they do not build significant reefs. Since the Pleistocene, this part of the Atlantic has been in the &QUOT;marginal&QUOT; zone of coral growth, where winter temperatures inhibit healthy coral growth. A more important limiting factor on the Bank is turbidity. No suspended detrital sediment from the continent reaches the Bahamas, accounting for the clear water in the Straits of Florida. However, the warm Gulf Stream surface water is supersaturated (by 40 percent) with dissolved calcium carbonate, and when the water washes up and over the bank rim, it is warmed. Agitation and evaporation cause massive chemical precipitation of a cloud of aragonite crystals. These accrete concentrically on nuclei of shell or coral fragments, growing into oolites, which are sand-sized pellets with a layered structure similar to hailstones. The clouds of limy precipitate and shoals of oolitic sand effectively inhibit coral growth today. Most of this oolitic sand originates within a few hundred meters of the bank margins, but currents distribute the sand into the interior of the bank. The small islands and cays are made up mainly of biogenic limy sand and mud derived from foraminifera, corals, mollusks, and calcareous plants (Illing, 1954; Newell, 1955). During glacial ages, when sea level was about 120 m lower than at present, the Bahama Banks would have been great emerged flat-topped limestone plateau islands. Their surfaces were riddled with karst sinkholes and the oolitic sand was blown into giant dunes of eolianite sand that has now recemented. As sea level rose in Late Holocene time, the karst sinkholes have flooded (known as &QUOT;blue holes&QUOT;), and the islands such as North and South Bimini are the tops of Pleistocene eolianite dunes. The Plate is an enlarged scene of the Bimini Islands at the northwest corner of the Great Bahama Bank (South Bimini is 83 km due east of Miami; see Figure C-15.1) taken from a Landsat-4 image made by the Thematic Mapper. Although this false-color image (Bands 1, 2, 4) was generated to emphasize shallow water and submerged shoals in realistic blue shades, the vegetation on the islands is in characteristic reds. Sandy Cay, an emerged barrier sand patch in lower center of Plate image, takes on the bright white color of oolitic sand. Figure C-16.1, a Landsat MSS image, depicts the largest Bahama Island, Andros, with its mangrove swamps. 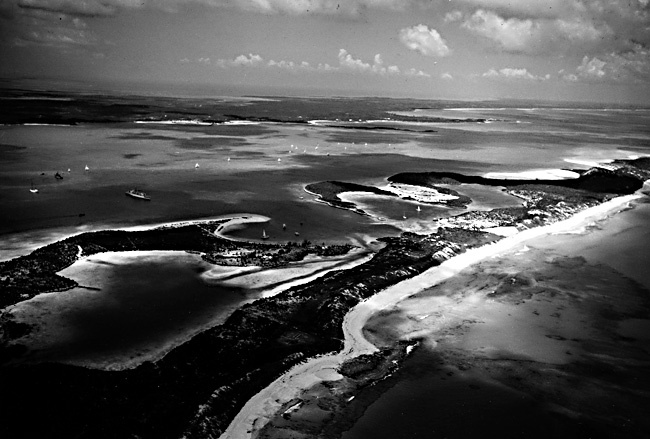 Sand sedimentation extends up to 100 km westward there, but the waters just to the east deepen to 2400 m in the Tongue of the Ocean, a channel that divides Andros from Nassau (upper right). Figure C-16.2 is an Apollo camera view of Eleuthera Island, with its shoals to the west, the Atlantic on the , and another deep-water channel (Exuma Sound) to the south. Figure C-16.3 is an view of a typical coral island (Stocking Island) in the Bahamas. Landsat TM 40182-15125, January 18, 1983.